Saturday morning at the park where we run the dogs, there was a thin layer of snow on top of a 6″ layer of crusty, aerated ice. Sometimes, when I stepped on it, my foot would crunch down several inches. Sometimes, my foot would sink only an inch. All times, it was slippery. Obviously not good terrain for tracking practice. I often have to run behind my dog while tracking, and no way was I going to run on that stuff. Mr. 4-Footed-and-Low-to-the-Ground wouldn’t mind, but I didn’t really relish falling. It hadn’t been snowing, though, so on Saturday, my tracking friend D. and I resolved to find a parking lot on Sunday morning to practice urban tracking (i.e., on non-vegetated ground, also known as gravel, sand, asphalt, concrete, etc.). Tracks, short with one 90 degree turn. At most, each leg was 50 yards (like I said, a small parking lot). My friend, D., laid Carlin’s track right next to a curb, which paralleled a sidewalk, and then turned 90 degrees to follow along another curb. Curbs were separated from the sidewalk by a 18″ high pile of snow. D. also laid down several pieces of dried liver along the curb to encourage searching. This turned out to be totally unnecessary, as Carlin ignored the liver. Carlin’s track was over in just a few minutes. Carlin took off from the start by following the curb for a few feet, then hopping over the pile of snow to the sidewalk. I stopped while he searched the sidewalk, and then went forward again as soon as he hopped back over and was following the curb. At one point, he hopped over to the sidewalk again and thought briefly about peeing on a tree in the parking strip. But I told him “No!” and “Go track”, and he was happy to come back to work. And then he just did it. He got back to the curb, followed it to the corner and made the turn, and then ran along the second curb to the glove. My friend had left a closed container of liver treats at the glove, so I was able to rip off my glove, give him a handful, and tell him what an amazing job he’d done. He picked up the glove and we walked (or rather, I walked and Carlin strutted) back to the start. What a good boy. He’s doing so well. Now I’m thinking that I’m going to have to get someone else to lay a track for us, so Carlin doesn’t get the idea that tracking is always following D’s scent. This morning, it was 1 degree F. No breeze, no sun, grey-white sky, not yet snowing again. My tracking buddy and I were at a large park nearby, one that was covered with 15″ of snow everywhere except the parking lots. The parking lots had only 4″ of snow. We were chatting, putting on boots, getting out harnesses and long lines, scent articles and leather gloves. We were getting ready to go tracking. “What?” she asked. “Why would you say that.” Hmmm. Not crazy then — maybe this is normal behavior for tracking aficionados in Boise in the winter. “That’s OK. You go lay a track in an open W shape with 3 corners over there,” she said, pointing to one end of the park. I’ll go lay one with three turns for Carlin over there,” pointing in the opposite direction. If I don’t totally screw this up, Carlin is going to do well at this game. And he’s going to love it. This morning, he was so excited to go find the glove that his pre-track pee was only a few drops, but his post-track pee was the long minute’s worth he’d been holding while on the track. 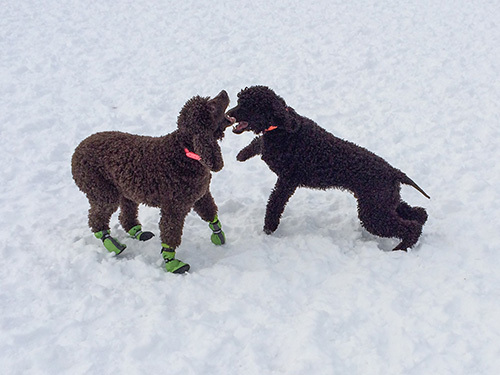 He did not pee on the bushes or trees or mounds of snow until he was carrying the glove in his mouth. That’s amazing all by itself. I need to get in better shape. Carlin charged through his track at 3/4 speed through the chest-high (on him) snow. I managed to keep up with him, but was breathing really, really hard by the end of the 300 yard track. As a side benefit, I was also plenty warm. I learned something about how Carlin communicates. When his nose is down, he’s sure he’s found the track. I can keep following him. When his head is up, he’s confused about where his track went and I should stop or move very slowly and wait for him to find it again. I learned a bunch about leash handling. Mainly, I learned that when Carlin comes back toward me, I have to throw the excess long line behind me rather than dropping it at my feet. That way I won’t step into the tangle, get my feet wrapped up, and trip. How did I learn this, you ask? I am not telling. Except to remark again on the 15″ of soft fluffy snow. 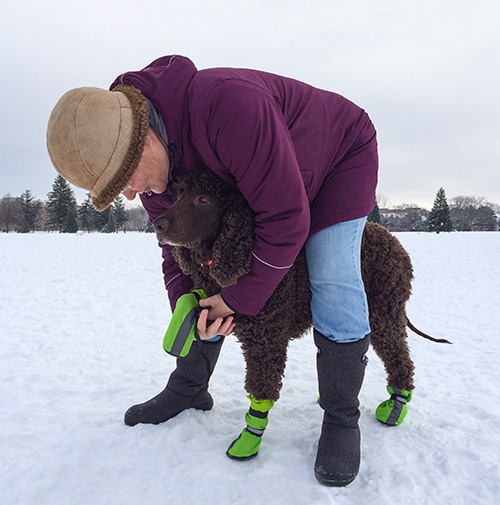 And yet more about leash handling. Keep the line taut. That way I can feel what Carlin is doing. If he slows down even just a little, I’ll feel it in the line and can try to anticipate what he’s going to do. Lastly, I started to learn about having no idea where the track is going. I was surprised by how disorienting that feels, to have no idea where I’m going. In past weeks, tracking in the snow, I could see the footprints because the bright sun created small shadows in each print. But today, the sun was hidden, the sky was the same color as the snow, there were no shadows, and I couldn’t see a footprint until I was right on top of it. And today we practiced in a public park. There were many, many footprints in the snow and no way to see which were my buddy’s and which weren’t. It was a great couple of hours. I’ve always loved being outside with my dog, doing what the dog loves to do. I can’t think of a better way to spend a cold, cold winter day. We got Tooey some snow boots. When we go running around in the snow, the poor girl quickly gets these huge snow balls between her pads and between her toes, and she feels she must get the snow out right now. That means she’ll run 20 yards, stop and lie down to chew out the snow balls, run 20 more yards, stop again, etc., etc. No fun at all, especially since Mr. Carlin Hotfoot just runs and runs and runs in zigs and zags all around her. So, boots. The ones we got fit her feet, but the front ones kept slipping down. 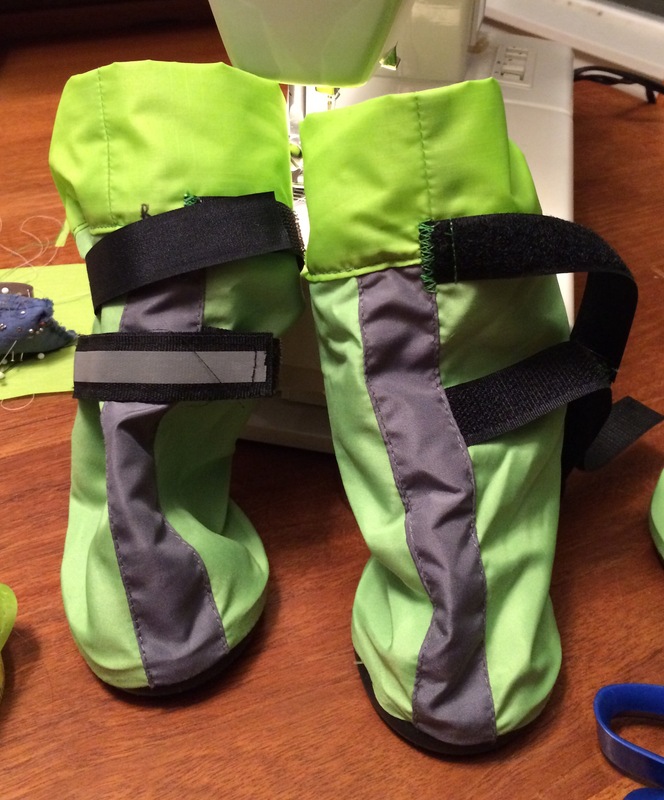 We determined that the front boots needed to be taller and have another strap that would tie around above the carpal pad. 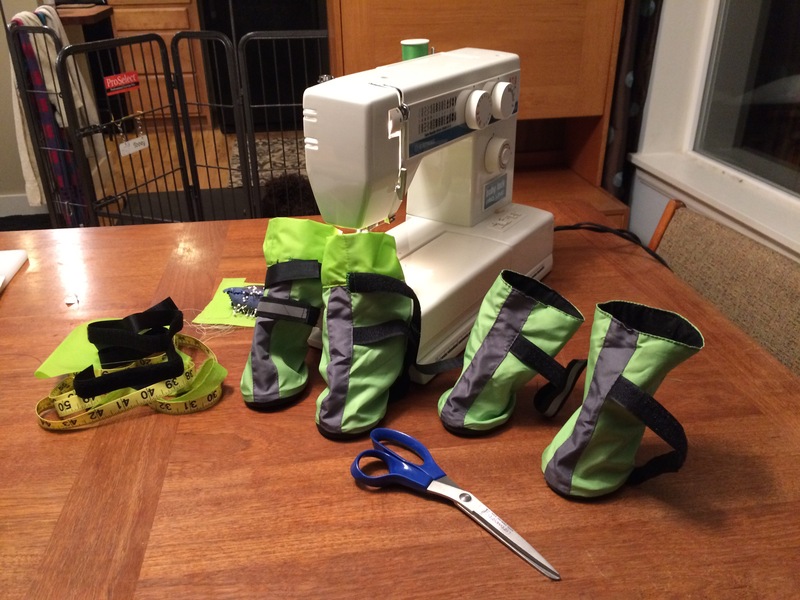 So, Russ bought some matching ripstop, and I did some sewing. Not quite as professional looking as the original boots, but they seem to work okay. Now she’s comfortable enough to zig in the show to Carlin’s zag. I think in the last several years, all the sewing I’ve done has been for the dogs. Dog rugs, holding blinds, snow boots. What’s next? Hmmm…. maybe some camo waterproof crate pads, like fellow IWS person, Ruth, makes.